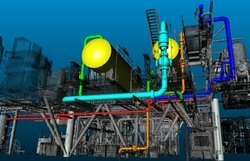 Nebula3d Services have the expertise and skills to provide services for large scale scanning such as Scanning of ProcessPlants,SteelPlants,PowerPlants,CementPlants,PipingLayouts,and Archeological Monuments.This helps our customers create as-built models, drawings, and maintaining digital records. We make use of sophisticated3DScanningTechnologyto digitize and obtain point cloud data. In today's competitive world, the advanced computer design tools have merged with high-definition laser camera scan data, which produces integrated images that are useful for outage and maintenance planning. A 3-D tool also enables the project team to perform virtual equipment removal or installation that is essential when each extra day of actual labor adds millions of dollars to outage costs. We have the expertise and skills to provide services for large scale scanning such as Scanning of Process Plants, Steel Plants, Power Plants, Cement Plants, Piping Layouts, and Archeological Monuments. This helps our customers create as-built models, drawings, and maintaining digital records. We make use of sophisticated 3D ScanningTechnologyto digitize and obtain point cloud data. From the design stage to the inspection stage, 3D scanning and measurement is an integral element of architecture, engineering, construction, and surveying. Detailed and accurate as-built documentation of buildings and environments saves hundreds of hours on planning time and misspent labor. Terrestrial scanning specialists with Nebula3D have experience with survey, new construction, renovation, historic preservation, and building inspection projects. From historic homes to international airports, terrestrial scanning services is an ideal 3D as-built documentation solution for any building or survey project’s needs. We have the expertise and skills to provide services for large scale scanning such as Scanning of Process Plants, Steel Plants, Power Plants, Cement Plants, Piping Layouts, and Archeological Monuments. This helps our customers create as-built models, drawings, and maintaining digital records. We make use of sophisticated 3D Scanning Technology to digitize and obtain point cloud data. Full capture of geometry for complex and organic shapes. Accuracy that previously could not be achieved by single point measurement. Data can be easily shared and reviewed by all stakeholders (see TruView product). Lower risk of design error (see clash detection product). Data can be captured remotely, safely and non-intrusively. Efficiencies gained by less time on site. Multiple production staff can access the dataset concurrently shortening project timeframes. Single scan datasets can be utilised to create a variety individual products. The same data set could produce both 2D elevation drawing, a 3D topographical survey or DTM. Relevant products can be extracted from the scan data through the course of a project, or as funds become available without the need for costly revisits to site. E.g. basic planning elevations can be enhanced to full architectural detail once planning is granted.